Taken from The Fibre Company Patterns: "Designed by Kate Gagnon Osborn and knit out of warm and lofty Tundra, this hat and mitten set features a large braided cable, deep ribbing. 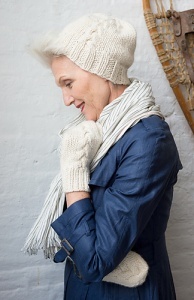 The hat has a slightly slouchy look, and the mittens feature a thumb gusset for optimum fit." This pattern is from The Fibre Company Patterns - Svalbard. Size US 9 & 10.5- double point needles and 1 US 10.5- 16" circular needle (or sizes needed to obtain gauge), stitch marker, tapestry needle, and a cable needle are required but not included. Finished Measurements: Mittens- 10.25" long x 7" Circumference, Hat- 20" brim circumference x 9" tall after blocking.